At the end of this month, the latest instalment in the much loved Mario Kart franchise will be released, bringing the racing action into HD for the first time on the Wii U. With so much new information being revealed recently, the levels of excitement for Mario Kart 8 have now built up to an all-time high. Not wanting to squander the opportunity, I thought I’d take this chance to relive my experience of when I first played the game for myself. At last year’s Eurogamer Expo, I spent most of my time in Nintendo’s corner of the exhibition hall, as there was a lot of buzz surrounding a few of their big hitters. One of the most notable games at the entire show in terms of hype was definitely Mario Kart 8. Despite the fact that brand new consoles (the PlayStation 4 and Xbox One) were available to play, the biggest queue that I ended up in was for Nintendo’s light-hearted racer. The gigantic display drew in huge crowds, and I was concerned that the game would not live up to everyone’s very lofty expectations. Fortunately, when it was my turn to step up to the controller, my fears instantly faded away. I played the game with a friend of mine who I had spent countless hours with on Mario Kart Wii. We’re both big fans of the series, and have had a lot of great experiences with the previous instalments, so we knew what we were looking for: frantic action, close calls and a lot of fervent shouting. That’s just the Mario Kart way. If you’re not screaming at your friends in both fury and delight, then you’re clearly not playing Mario Kart. But on that Sunday in Earl’s Court? We shouted a lot. Oh, there was so much shouting. As part of the demo, we had the chance to play three of the new tracks. The first, Mario Circuit, is shaped like a Mobius strip. Now, that may sound impossible to drive on, and usually it would be, but this is where MK8 gets to show off some fancy new tricks. The past games have all introduced a new gimmick to enhance the gameplay and keep things fresh, and of course this rendition is no different. In this game, players will be able to drive up walls, on the ceiling, or just about anything they can think of using anti-gravity. By driving over glowing blue strips in the road, the wheels of your vehicle turn on their side and become gravity-defying hover pads. This means that a road can twist upside-down partway through and you’ll still stay gripped to the tarmac (or dirt, or piano keys, or even cake depending on the course). Not only does this create some fantastical visual effects and course design, but it also makes alternate routes on the track far more dynamic and interesting. In addition, anti-gravity has the added benefits of changing tactics during a race. Instead of being slowed down when hitting an opponent or obstacle, the hover pads will actually give you a boost upon impact, spicing up the action just that extra bit more. Mario Circuit, then, was a good introduction to the concept – it has a simple design with a literal big twist. The sweeping curves were also a dream to drift through, promptly ticking off the checkbox in my head labelled “handles well”. Regardless of whether you use motion control or traditional controls, the karts and bikes respond with pitch-perfect precision to your inputs, allowing both my friend and I to hit every apex on Mario Circuit without a hitch. The other two courses were Toad Harbour and Twisted Mansion. Even though these tracks are opposites in tone (a bright, summery port town vs. a gloomy, spooky ghost house), they both revealed the same great strengths of the game. In terms of gameplay, they displayed how well anti-gravity affects alternate paths, as well as how seamlessly Mario Kart 7’s gliding and underwater sections are incorporated. Seeing fellow racers drive upside down above you is truly thrilling, as is flying down a hill reminiscent of the streets of San Francisco, or driving into a suspended wall of water. The variety and imagination that Nintendo’s EAD Group No.1 have managed to squeeze out of the simple concept of racing their mascots is staggering and it left me wanting more. They had to pry the controller out of my hands. The other thing that was immediately notable from these tracks was something that I was too distracted during the first race to appreciate fully: this game looks astounding. Not just for a Mario Kart game, not just for a Wii U game… no. For a 2014 next-gen videogame, Mario Kart 8 is one of the most stunning titles I have seen. The developers really know the hardware inside-out, and they exploit every trick in the book to get the extra dazzle seen here. The lighting is bewilderingly vibrant and the textures are rich and detailed. The main thing that holds together the eye candy is not a technical feature, however – it’s the sublime art style. No matter how wacky the concepts get, everything fits together and looks like it belongs because of the cohesive design by the art team. Seeing this run in full 1080p at 60fps in person is something to behold, and online videos really cannot do it justice. In all, my experience was a delight. I ended up going back to that demo stand three more times. There wasn’t one person who played it who didn’t go back at least a second time to throw some red shells at their opponents and take a boost mushroom to victory. But that was only a demo build from last year – it was incomplete and not fully realised. Recently though, Nintendo has shown us in their special Mario Kart Nintendo Direct presentation what this joyful juggernaut is really capable of. The only big gripe I had with 2008’s Mario Kart Wii that I wanted to see acknowledged and resolved for MK8 during this Direct was that it wasn’t very balanced. The bikes were clearly better, so there was no reason to use a kart. 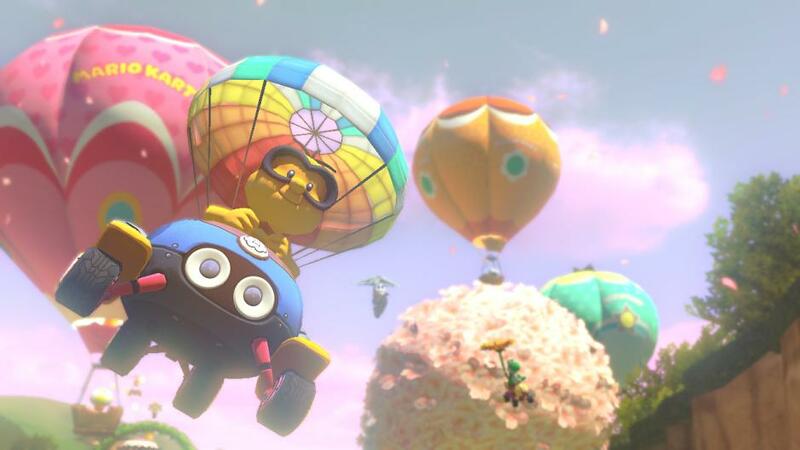 Nintendo have immediately addressed this by demonstrating in detail how they levelled the playing field between the two vehicle types, with karts being better on the straights and the bikes in the corners. The online system has also been overhauled so that now players can create their own tournaments, customise the race settings and chat in the lobby, and another great feature allows players to edit together their favourite highlights into a short video to share with the world on either Miiverse or YouTube. To round off the level of polish, Nintendo have even recorded live musical instruments for MK8’s songs as opposed to having a digitally created MIDI soundtrack. Overall, from what I’ve played, and from the improvements we’ve now been shown, I think it’s safe to say that May 30th cannot come quickly enough for Mario and friends to drift back into the hearts of gamers everywhere. I’ll be seeing all of you on the track – armed with bananas, naturally.